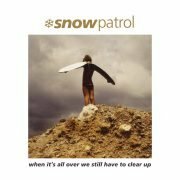 We’re thrilled to announce that Snow Patrol’s wonderful sophomore album ‘When It’s All Over We Still Have To Clear Up’ will be released on vinyl for the first time ever on 1st March 2019! The first pressing will include a Limited Edition bonus GOLD vinyl 7″ featuring two previously unreleased songs: Hollow As I Am & And Then I’m Gonna, and the first 225 copies ordered from our store will be signed by original members of the band! The release is exclusively available for pre-order in the Jeepster store now so grab yourself (or someone else!) a copy quick to be in with a chance of it being signed.